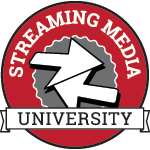 Includes access to all Streaming Media West and Live Streaming Summit keynotes, conference sessions and networking events PLUS two half-day Streaming Media University workshops. Includes access to all Streaming Media West keynotes, conference sessions and networking events PLUS two half-day Streaming Media University workshops. Includes access to all Streaming Media West AND Live Streaming Summit keynotes, conference sessions, and networking events. Includes access to all Streaming Media West keynotes, conference sessions, and networking events. Includes access to all Streaming Media West keynotes, conference sessions, and networking events for selected day only. Includes access to all Live Streaming Summit conference sessions and networking events PLUS two half-day Streaming Media University workshops. Also includes access to the Streaming Media West keynotes each morning. Includes access to all Live Streaming Summit conference sessions and networking events. Also includes access to the morning Streaming Media West keynotes each morning. Includes access to exhibit hall, Discovery Track sessions, Exhibit Hall reception, Streaming Beer Garden reception, and keynotes. Does not include entry to the Sunset Welcome Reception. Find out more about this pass. Our new Discovery Pass is the perfect way for attendees to discover more about the streaming video industry and what the Streaming Media conferences are all about. Find out more here. The Streaming Media West expo offers attendees a firsthand look at the leading software, hardware, and network solutions and services in the streaming media industry. View the 2016 exhibitor list here. Tuesday, November 1 ... 10:00 a.m. – 6:00 p.m. Reception 5:00 p.m. – 6:00 p.m.
Wednesday, November 2 ... 10:00 a.m. – 3:15 p.m. Registration will be located in the Conference Center foyer of the Hyatt Regency Huntington Beach Resort & Spa and will be opened during the following hours. Monday, October 31 ... 8:00 a.m. – 4:30 p.m.
Tuesday, November 1 ... 8:00 a.m. – 6:00 p.m.
Wednesday, November 2 ... 8:00 a.m. – 4:00 p.m.
Attendees are responsible for making their own travel arrangements and hotel accommodations. For more information please visit the Venue page. Cancellations received on or before September 30 will receive a full refund minus a $50 processing fee. There will be no refunds for cancellations made after September 30. Press registration is available to those who serve in a professional editorial capacity for a regularly published periodical, news service, or the broadcast media. For more information please see the Press Page. The organizers and management of Streaming Media West 2016 reserve the right to make necessary changes in this program. Every effort will be made to keep presentations and speakers as represented. However, unforeseen circumstances may result in substitution of a presentation topic and/or speaker. Information Today, Inc. assumes no liability for the acts of their suppliers nor for the safety of any Streaming Media West 2016 participant while in transit to or from this event. The total liability during the precise hours of the meeting will be limited to a refund of the attendance fee.